AC 724는 Silicon 계 고 진공 확산펌프 오일로서 DC 704 같은 structure formula(분자구조)로 제조되어 DC 704등의 Silicon계 Diffusion pump oil와 동일한 특성과 성능을 가집니다. 열에 대한 내 산화성이 좋아서 공정 중 산소에 노출되어도 성능저하가 거의 없어 타 오일에 비하여 더욱 오래 사용할 수 있습니다. Thermal stability, Resists oxidation, Chemically inert. Volumes of gas or vapor in production operations. Shorter conditioning runs : Single-component silicone oil reach maximum potential in far less time than that required for multi-component organic oil. The recovery rate of silicone oil after exposure to air at operating temperatures is many times faster than that of organic oil. 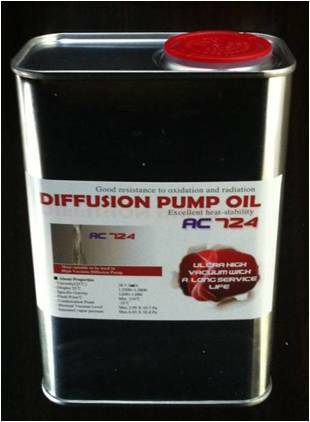 AC 724 Diffusion Pump Oil can be used in a variety of applications including. Evacuating television and cathode-ray tubes. Melting, degassing and sintering refractory metals, thick-film deposition.